SCRET visited the Dawn in November 2001 - divers Kevin Connell and Mark Tourtellot on November 11, 2001, and Walter Jaccard and Brett Peck on November 24, 2001. 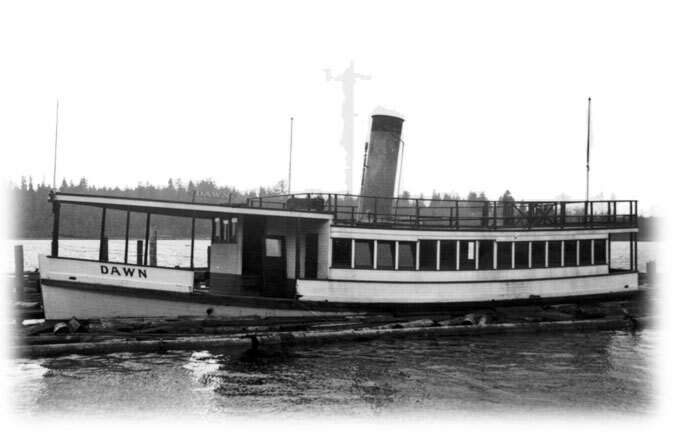 The Dawn’s hull presently sits upright on the bottom in 110 FFW at the south end of Lake Washington. The ship is generally intact. The bow is narrow with a very fine entry. The main deck is intact from bow to stern, along with a cabin roof/top deck that runs the entire length of the vessel, from bow to stern (the perfect “northwest boat”). The main cabin on the starboard side leans outward and has collapsed approximately one third of the distance back from the bow. There are many rectangular windows along the port side of the cabin. There is an intact staircase at the stern on the starboard side, which provides access from the main deck to the cabin roof/top deck. The railing hardware for the top deck is missing. In the center of the stern deck is a square access hole approximately 2 feet square that allows access to what appears to be a gearbox of some sort. There is little structure inside the cabin, although there are the remains of wooden seats along the port cabin wall. There is a shaft in the center of the vessel that runs from the stern approximately 2/3 of the way to the bow. This shaft was probably connected to the propulsion system/engine, which is missing. There is a hole in the roof where the funnel would have been. View the photos from this dive. SCRET divers John Sharps and Chris Dutton visited the Dawn in March of 2004. For our dive on the Dawn we chose to fill our steel low pressure 104s with a Trimix blend of 30% Oxygen, 30% Helium. This would help ensure clarity and minimize decompression. Prior to the dive we planned to spend 30 minutes on the bottom in order to allow us enough time to both locate and survey the Dawn’s current condition. We dropped our independent anchor and buoy line right on top of where we received positive feedback from both the GPS and the boats fish finder. Once the line and buoy were in place we made passes back by the buoy to see if the fish finder still made positive references to the wreck near our line. We pulled and reset the line twice before finally on the third try everyone onboard felt like we were right on top of the wreck. With surface support from Mark Tourtellot and Walter Jaccard, we donned our gear, gear checked each other and were in the water a short time later. Once in water we double checked that our long hose primary regulators were free to donate in an emergency, checked each others 1st stages for signs of bubbles, flipped on our HID lights and began the descent down the line. At about 80ft we started to make out the shape of timber which was a good sign: we were dropping right on top of the wreck and visibility was better than average for the lake. At the bottom we found the shot ball from our buoy line sitting right on the top of the deck near the stern. At depth visibility was still pretty good but good for the lake means you can see about 10ft. Remembering reports that the propeller was still in place I signaled for us to drop off the square back of the boat and down to the propeller. Very quickly the true position of the wreck appeared clear in my mind as I realized we had not dropped off the back but instead dropped right down into the heart of the wreck; we now had structure above us and in every other direction around us. What I had incorrectly assumed was the square back of the ships stern was actually the large square void that was left remaining after the Dawn’s smoke stack was removed. With heart rates up a bit we maintained our horizontal position and then slowly and carefully made our way back to the opening and ascended back to the top of the wreck. After the unintentional penetration we decided to circle the outside of the Dawn and ended up making two full circles around the ship at two different levels within our self allotted 30 minutes of bottom time. Though the Dawn’s machinery was removed prior to her sinking, today she sits upright and otherwise intact in 114 feet of fresh water. While the window glass has been removed their hinged framing is still operational. It is a ghostly experience to see that a window or a door still swings open with the slightest touch. Inside the propeller drive shaft is still visible and there is some miscellaneous planking strewn about but otherwise the wreck is wide open and empty. Though I had done the research on the Dawn prior to the dive I was still surprised by its enormity once I saw it with my own eyes. For a Northwest wreck it is in beautiful shape with only a small portion of the upper stern deck that has collapsed; and I suspect that damage actually occurred prior to sinking while it sat in silence - post the completion of the I-90 Bridge but prior to its final voyage to the bottom of the lake. It isn’t often us Northwest divers get to see a sunken treasure of this nature, in this condition. On our second pass around the wreck we ventured to the base of the hull, where we discovered the Dawn is not completely submerged into the mud. 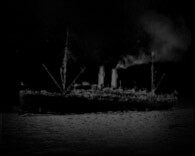 It is actually sitting on two high points; almost like two independent stands made of mud; these two stands holding a good portion the wreck up and out of the water. A diver could actually swim under portions of the wreck should they be so inclined. At 30 minutes into the dive; with a successful survey of the wreck behind us, we signaled the end of our bottom time and gave each other the thumbs up sign. We ascended slowly to our first deco stop then moved gradually to our 70ft stop. Here at 70ft we switched from breathing our back gas to an Al40 decompression bottle carried on our left side. The deco bottle contained a 50% oxygen blend to help speed the off gassing of accumulated nitrogen. The gas switch and subsequent slow and stepped decompression ascent to the surface was uneventful - though we were both anxious to get to the surface and talk about the dive. Once on the surface and breathing regular air again, we squeaked a few residual helium laden sentences out about the good position of the buoy line, the successful dive behind us and we vowed to come back.